I know it's been a while, and I do apologize to all you faithful readers. I'm entering a rather busy time of the semester right now, and sadly will not be able to post as much as I have been over the past few months. But don't worry, come March 24th, I will be dedicating most of my time to you. Well, to cooking at least. I will, of course, try to get the occasional post in when I have some free time to cook and dream up recipes. This Friday evening was one of those times. 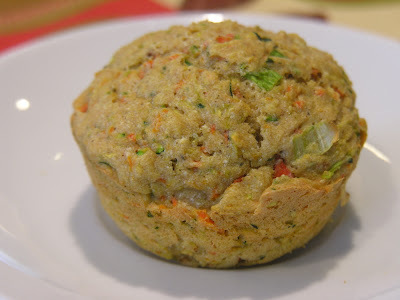 After a week of getting serious about some academic projects, I was ready for a little baking break, and I happened to have dreamed up a lovely idea for savory muffins. We had some fat-free ricotta in the fridge for some pasta I made a few nights ago, and I thought that instead of the already-done cottage cheese muffins, ricotta might just make a tasty, baked little treat. 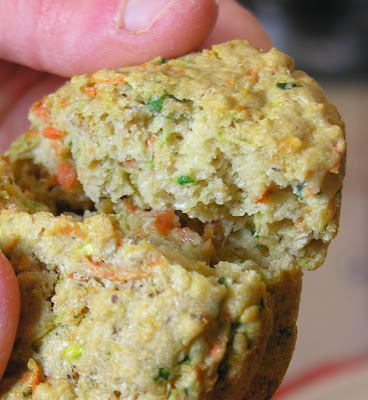 I mentioned my carrot-sage cornbread mini muffins in my Thanksgiving redux post, and these were roughly based on that idea. I skipped the cornmeal, though, and added some more veggies: zucchini and green onions. These have quite a bit of ricotta in them, so they don't bake up quite like regular muffins. They are much moister and creamier than most muffins, which tend to be on the cake-y side. I was a bit worried when they first came out of the oven - they were yummy, but I was afraid that after a day or so they would deflate and get gummy. Luckily, that wasn't the case. They were delicious the next day, and even the day after that. As we stuffed our faces with tasty, savory muffins, Jonathan and I tried to think of some good accompaniments to these little treats. They'd be perfect for brunch, with scrambled eggs, or for lunch, or for dinner alongside some roast chicken...the list continues, although naturally we finished all of the muffins before we got to pair them with any other foodstuffs. In a medium bowl, mix flour, baking soda and powder, salt, pepper, and spices. In a separate bowl, mix egg, oil, ricotta, and buttermilk. Using a food processor or a grater, grate the carrots and zucchini until finely shredded. Using cheesecloth or a sturdy colander, press as much of the water as you can out of the carrots and zucchini. Dice the onion by hand. Pour wet ingredients into dry, stirring a few times. Add the drained vegetables and diced onion, and stir to combine completely. Don't overmix. Fill 12 muffin cups (greased or lined) about 3/4 full, and bake at 375 degrees until firm on top, about 20-25 minutes. Muffins will be slightly custardy, but dry when fully baked. Allow to cool and enjoy! Wow, I have never seen anything but the classic fruity muffin before. The veggie variety seems delicious though! My daughter and I both want to print this one out and add it to our recipe collection. Ohhhh! Those looks good. I mean how can you got wrong with ricotta? What a great muffin! And packed full of veggies!